The Russian ruble, Turkish lira, and Iranian rial are all falling in value. What do they have in common? The United States is in some way involved in their decline. It’s a sign of US power: Even as its military becomes more limited and it threatens to pull back from the Middle East and other parts of the world, the US can still put pressure on the economies of countries that are working against US interests and impact global conflicts without resorting to military force. For Russia, recently imposed sanctions and the threat of new sanctions are proving to be a drain on its economy and the ruble. Earlier this month, the US announced a new round of sanctions that target Russian oligarchs and their businesses. Rusal, a metals conglomerate and one of the world’s largest aluminum producers, was hit particularly hard, with its shares declining by nearly 35% in two days. 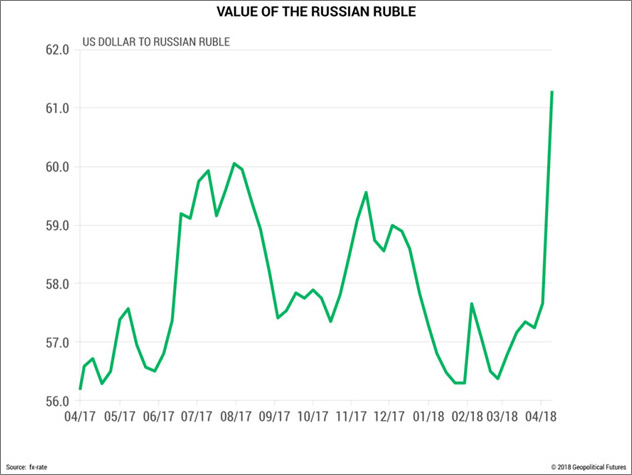 But Rusal wasn’t the only company with ties to the Russian government to experience a rapid sell-off: Sberbank and VTB, two major Russian banks, saw their share prices decline by nearly 20% and 10%, respectively after the sanctions were announced. Some financial analysts have estimated that up to $16 billion in wealth owned by Russian oligarchs was wiped out in just a couple of hours. Through the use of so-called secondary sanctions, which target both US and non-US companies that do business with sanctioned Russian companies and individuals, the US is restricting Russia’s access to dollars. This limits Russian companies’ ability to conduct transactions globally in dollars and their access to foreign investment. For example, Rusal has been forced to ask its customers to fulfill contracts in euros rather than dollars. The declining ruble also makes foreign machinery and equipment—which are among Russia’s top imports and which Russia needs to modernize its economy—costlier.